We know that asking NASCAR not to cheat is like asking an old Volkswagen not to drop oil, but a new ruling means that the series (and this comes as a shock) may now actually strip the benefits of winning from rule-breaking cars. You know what this means? Teams will just have to cheat harder. 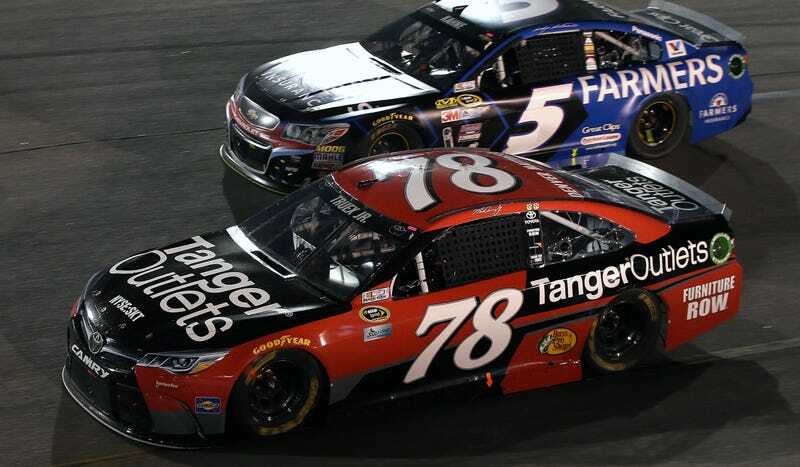 In the Sprint Cup Series, the first violation would result in an encumbered finishing position, the loss of 35 championship driver and owner points, as well as a three-race suspension and $65,000 fine for the crew chief. In the XFINITY Series, the penalties would be the same, but the crew chief fine would be $20,000. Some of teams’ most egregious attempts to cheat are now caught by officials during the race, however, NASCAR’s laser inspection system takes a series of measurements to catch anything else that’s out of spec. (You can read a lengthy explanation of how it works here, if you’re curious.) Likewise, the lugnut inspection makes sure every nut is on each wheel. For the Chase, any team with three or more missing lugnuts gets the dreaded encumbered finish. Quite frankly, we’ve gotten bored of hearing that a driver with an out-of-spec car gets to keep their result anyway. Matt Kenseth even failed the post-race inspection after winning a race this year, and that win no doubt helped solidify his entry into the Chase. Usually, the crew chief just gets a fine, and the team gets docked both owner’s and driver’s points. It’s beyond toothless. Top-ten cars repeatedly get busted for the same post-race offenses and don’t care because the penalty doesn’t matter. With the Chase, the points matter even less if you win, as a win advances you to the next playoff-style round (or potentially decides the championship). So, you know what this means, NASCAR: cheat harder! Channel your inner Smokey Yunick.